We remember watching our mothers use it morning and night. We remember having the soft white cream massaged into our skin after a bath, or before we went out to play. We even remember our fathers using NIVEA Creme as a shaving lotion, or as a soothing aftershave balm. It’s memories like these that have made the blue tin a part of family life for generations. Yet there was a time when the blue tin wasn’t blue at all. 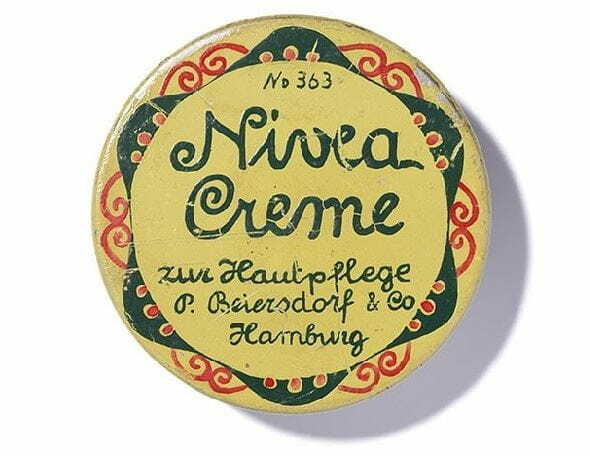 When we launched NIVEA Creme in 1911, it was originally packaged in a yellow tin decorated with green art nouveau tendrils. It wasn’t until we decided to introduce a more contemporary design in 1925 that the blue tin was born. Since then, NIVEA Creme’s blue tin, unique scent and velvety texture have remained largely unchanged. Perhaps this is why NIVEA Creme resonates so strongly with so many people. It doesn’t just provide reliable, nourishing care – it evokes the sights, smells and textures we associate with childhood, too. Whatever the reason, the blue tin has now become one of the most successful skincare products of all time. But more importantly, it’s now a tradition for millions of families in more than 200 countries around the world. And we hope it will keep giving people beautiful memories for many years to come. NIVEA is one of the world’s most trusted skincare brands, but it took three minds with one shared vision to make it happen. It all began in 1911, when the pharmacist and visionary entrepreneur Dr. Oscar Troplowitz recognised the potential in Eucerit, an emulsifier developed by the chemist Dr. Isaac Lifschütz. Our Head of Advertising, Juan Gregorio Clausen, was strolling through Hamburg when he passed by a photographer’s shop. Hanging in the window was a photo of three happy, cheeky and fresh-faced young brothers: Rolf-Robert, Peter and Wilhelm Wiethüchter. Juan knew instantly that this clean and wholesome family image captured the essence of the new NIVEA perfectly. So after we acquired the rights to the photo from the boys’ parents, the Wiethüchters became the new stars of our advertising in 1924. The campaign was a huge hit, and the brothers were soon greeted with cries of “Hello NIVEA!” wherever they went. And that wasn’t the only attention the boys received. When NIVEA Creme was first introduced to the world in December of 1911, our goal was one thing: better skincare for everyone. 100 years later, our goal hasn’t changed. Our product range, however, has dramatically expanded to give you more options for the way you care for your skin. As the demand for NIVEA Creme has grown over the years, we’ve grown with it. Early on, new products were developed and added to our range to meet the variety of skincare needs, including NIVEA Soap in 1919 and a selection of hair care products called NIVEA Hair Milk in 1920. However, it wasn’t just an increased product range that people were looking for. They wanted products that were specifically tailored for their skin. In 1922, we delivered the first NIVEA product for men: the NIVEA shaving soap. When combined with the NIVEA Creme as an aftershave treatment, it became one of the first men’s skincare routines. Around this time, breakthroughs in product development were being made that helped us cater to the individuality of the human skin. Committed NIVEA researchers studied these individualities and, thanks to their discoveries, people all over the world were able to find the answer to skincare needs related to their culture, gender and age. People in Asia, for example, favour a pale, white complexion. In 1927, we introduced the NIVEA Whitening Paste, which helped them to achieve this look. Today, we offer a wide range of moisturisers, body creams, deodorants, cleansers and sun protection products with whitening ingredients, which continue to be some of our most popular products throughout Asia. The post-World War II baby boom also had a dramatic effect on skincare needs. In 1960, we launched the NIVEA Baby fine product range, so that new parents could care for and protect the delicate skin of their newborns. By 1972, our Baby range consisted of a powder, bath, cream, soap and cotton-wool tips. And in the 90s, we further extended the range to provide a complete care and cleansing program for the sensitive skin of babies. While the babies were cared for, we began focusing more on mature skin. We succeeded in 1994, when we developed NIVEA VITAL, the first special care series for mature skin. In 1998, our research led to another pioneering cosmetic innovation: the anti-wrinkle ingredient Q10. The ingredient was used to create the NIVEA VISAGE Anti-Wrinkle Q10 Day Cream, which quickly became a bestseller. Throughout the decades, we have introduced you to many innovative skincare products – from deodorant to sun protection – and we’re always looking for new ways to improve our existing products. We work with some 50 institutes, in places as far flung as Brazil, India, China and South Africa, to test all of our products and ensure that they are suitable for your skin. We even set up a special Asian and Latin American laboratory at our headquarters in Hamburg so we can continue to cater to more specific skin types and climates. No matter what your age, race, location or culture, NIVEA has you covered. Until the early 1900s, most people spent their leisure time indoors. Tans were considered to be unsophisticated and lower class, as only labourers and other manual workers tended to spend enough time outdoors to get them. All that changed in the 1920s, when the post-war zest for life saw people of all ages and backgrounds head outdoors – and where possible, to the beach – in their spare time. And when Coco Chanel was snapped with a suntan in 1923, it heralded the dawn of a new era. Looking bronzed and brown was officially ‘in’. Of course, this was before people were aware of the link between sun exposure and skin damage. Even so, we were dedicated to helping people avoid one nasty side-effect that many people were already all too familiar with: sunburn. With this in mind, our ads began emphasising NIVEA Creme’s ability to protect skin from sunburn and provide soothing after-sun care. Many also contained information to help people enjoy their time in the sun more safely, such as weather forecasts or advice about protecting skin even on cloudy days. And we released the world’s first sunscreen, NIVEA Ultra-Oil, way back in 1936. By the 1960s, economic prosperity and rising car ownership saw more and more people take their holidays by the sea, and beach culture boomed. Once again, NIVEA was there to help people make the most of their time in the sun. “NIVEA caravans” were a common sight at international resorts throughout the 1960s and 70s, and they gave away the now-iconic NIVEA balls to anyone who’d brought a NIVEA sun protection product to the beach. Demand for these balls was so great that sometimes our caravans didn’t even make it to the beach – they’d be mobbed on the street before they could get there! It was also around this time that scientists first began establishing the link between sun exposure, skin cancer, and skin damage, such as premature ageing. These discoveries spurred our researchers to develop groundbreaking products that would protect people from these effects, and make it easier to enjoy the sun safely. Before the beach ball, there was the NIVEA ball. And it took the world by storm. Originally created in the 1930s as a 3D version of the NIVEA Creme tin, the inflatable NIVEA Ball was designed to help people make the most of their leisure time outdoors. While it was initially popular in Germany, the NIVEA Ball really took off in the 1950s, when post-war prosperity gave people money to spend on holidays and having fun. As cars became increasingly affordable, people began flocking to beaches and the great outdoors – and the NIVEA ball became the perfect holiday accessory. It was easy to pack and even easier to inflate. And it was fun for the whole family. By the 1960s, the NIVEA ball had become a huge hit, and it remains popular to this day. We’ve produced more than 20 million balls over the last 40 years alone, and people around the world know it and love it. And just like our skincare products, the NIVEA ball brings us closer to the people we love. That’s why this simple, inflatable rubber toy has been one of our most active and understated brand ambassadors for decades. For the past century, we’ve provided consumers with expert skincare, and you’ve responded by letting us know exactly how you feel about our products. The truth is, we love our fan mail. The archives at our headquarters in Hamburg, Germany are filled with countless letters and postcards that we’ve kept, which express our customers’ affinity for NIVEA. One letter, written in 1927 by Austrian actor and cabaret performer Paul Morgan, was particularly humbling. He wrote, “NIVEA Creme is addictive! Having succumbed to it, you will never again be able to do without it.” Many of the letters in our archive have come from children and include lovingly drawn pictures. One such picture thanks the company for a NIVEA beach ball, while another proudly declares that, “at our house, not a day goes by without NIVEA!” At our Hamburg location alone, we receive more than 1,200 questions, suggestions and “thank you” letters each week. Every year, some 100,000 consumers worldwide provide feedback about NIVEA products. Today, telephone calls and email have largely replaced old-fashioned letters. And thanks to social networks like Facebook, it’s never been easier for fans of NIVEA to connect with us from anywhere in the world. Thank you to all of the fans that have written to us over the past 100 years. We hope you’ll keep close and continue to let us know how NIVEA makes you and your skin feel. Q10 is a natural, vitamin-like substance that can be found in every cell of the human body. It plays a key role in cell metabolism, or the way in which our bodies convert food into energy. When we began searching for active skincare ingredients – that is, substances that produce lasting changes to the skin – it made sense to start by looking at substances that occur naturally in the body. Dr Franz Stäb, one of NIVEA’s leading biologists, was part of the team that started this research 20 years ago. “First, we tested the most important active substances of the metabolism, one of which was Q10,” he explained. “We asked ourselves whether older skin was deficient in these substances, and what would happen if it was given more of them. That was how we discovered the effects of Q10.” When Dr Stäb and his team realised that older skin had lower levels of Q10 than younger skin, their next challenge was to find out how this might be related to skin ageing. What they discovered was groundbreaking: Q10 stops free radicals, or molecules that are known to cause skin ageing, from damaging cells. The next step was to create a skin cream with Q10. But the team found that this wasn’t easy. “We had to play around quite a bit before we managed to develop a formula that prevented Q10 from being destroyed, which can happen very quickly if it is exposed to sunlight,” Dr Stäb said. “We had to find the right mix between the base of the cream and the active ingredient, Q10. That is what makes our Q10 products so special.” In 1998, the first NIVEA cream with Q10 hit the market, and its effectiveness made it a huge success. As Dr Stäb said, “Scientific tests with our Q10 creams clearly prove that they noticeably smooth wrinkles.” Today, a NIVEA Q10 product is bought every few seconds, and our NIVEA Visage Anti-Wrinkle Q10 Day Cream has become one of our bestselling anti-wrinkle creams. Now, products with enriched with Q10 can be found across all our relevant categories, from NIVEA For Men to NIVEA Sun. Our skin lets us feel the breeze of the wind, the warmth of the sun and the touch of the people we love. Our skin tells others how we feel. We blush when we are paid a compliment. We get goosebumps when we are frightened. And our skin is never more radiant than when we are happy. NIVEA understands skin like no one else. That’s why we create products that cleanse, nourish and protect your skin, while giving it exactly what it needs – gentle yet effective care that keeps your skin smooth, supple and radiantly beautiful. No matter what you do, or where you live, we’re here to help you enjoy better skincare for life. Whether you’re male or female. Young or old. Fair or dark. Oily or dry. Sensitive or normal. Or anything in between. We care for all your skin. For life.